A taxi, also known as cab or taxicab, is a vehicle for hire with a driver. It can be used by single or a group of the passenger to commute from one place to another. Taxis have been serving humankind for over three centuries now. A variety of taxis you can see all around you. From the traditional yellow cabs to the luxury limos or sedans, the utility of the taxis cannot be denied. Let’s have a look at the history and origination of the taxis. In the early 17th century, horse-drawn for-hire hackney services for carriage began their operations in London and Paris. The first example of taxi regulation was set by the royal proclamations as they regulated the number of carriages in both the cities. Because of the improved speed and safety, hansom cabs replaced the older designs of taxi transportation. In order to fairly calculate the fare as per the distance traveled by the passenger in the taxi, meter-equipped taxicabs were introduced. Gottlieb Daimler built the first modern meter-equipped taxi “Daimler Victoria” in 1897 and in the same year, the first motorized taxi company started its operations. 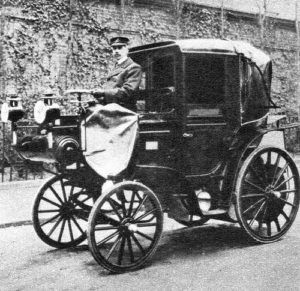 Taxis powered by gas started their operations in Paris in 1899 followed by London and New York in 1903 and 1907 respectively. The taxis in New York were imported from France. Harry N. Allen was the developer of those taxis. The yellow color of a taxi has a brief history to it as well. Harry N. Allen, after learning the fact that, yellow color can be seen easily from a distance, was the first person to have started painting the taxicabs in yellow color and till now this color is widely used for taxis. The number of taxis in Birmingham and around the world increased at a rapid pace at the start of the 20th century. The major inventions in the taxicabs occurred with the innovation of the two-ways radio in the late 1940s and the computer assisted dispatching that was introduced in the 1980s. The radios in taxicabs enabled them to communicate with the customers and serve them in a better way than the previous methods. In order to get the certification of a vehicle to be a taxi, the owner of the vehicle has to go through a lot of formalities and legal struggle. Each country has their own governing bodies regulating the rules of taxis. Lima, London, New York City, Mexico City, and Tokyo are the cities having the largest number of taxis around the world. Different models of vehicles are used as taxicabs around the world. Soviet taxi cabs in Afghanistan and Classic Ford Falcon in Australia are the most preferred ones. Other common cars used as taxicabs are Toyota Corolla, the scion xB, the Hyundai Elantra, the Volkswagen Type1, and the Toyota Prius. Coming to the present, many private companies have emerged around the globe providing taxi services to the people. They are making the most efficient use of modern technology to make things easier for the passengers to hire services of a taxi. People who have their cars idle at home can use them as taxis and can use them for earning purposes.